Weather is one of the most important things that golf course superintendents have to keep an eye on. 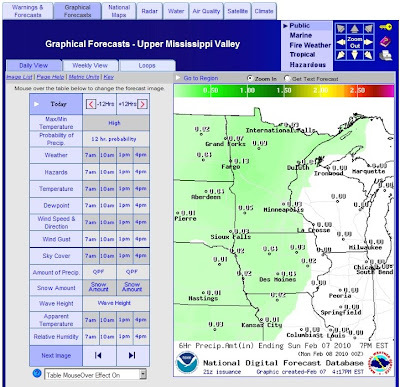 I am often asked where I get my information, so I thought I would review my favorite weather websites here. My weather "homebase" is the National Weather Service Chicago site which links to a massive amount of current and historical data. From here you can search for the Villa Park forecast. Most of the hundreds of weather websites out there simply copy this data. It's the real deal, and it's updated often. Sometimes, I check out Intellicast because I like the format of some of their charts, but the data is often identical or only slightly different. When it comes to planning more than 2 days in advance, I don't rely too much on any weather forecast. If we planned our whole week based on the forecast on Monday, there is a 100% chance we're going to change it! I rely on weather data more for predicting what types of jobs we will have to be doing based on general trends. No one can predict the weather perfectly but examining trends in tempurature, humidity, wind, and sunshine and their effects on turf is essential to taking care of a golf course. These trends help us time fertilizer applications, determine how to irrigate, predict disease outbreaks, and schedule daily tasks. 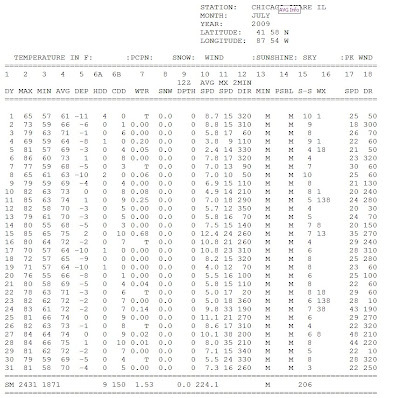 Over the winter, we have been working on assembling a lot of historical weather data into one spreadsheet. Observing historical trends and what they have meant to the course at Sugar Creek will help me better time maintenance practices in the future. There are a lot of times I would like to know seemingly irrelevant facts, like the high temps during the summer of 2006, or the amount of rain that fell in 2005, or the number of days in a row with over 90% humidity during a stretch of 2007. There are two sources I use to find out. The other site with free historical data is called Weather Underground. 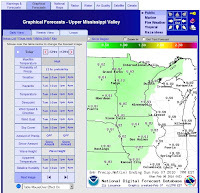 Want to know if it was raining on your birthday in 1996? You can search for it here. There are a lot of radar websites out there. Some are prettier than others; but pretty doesn't mean accurate. It's my opinion that the National Weather Service Base Reflectivity Loop is the best free radar on the web. This is a raw radar loop that doesn't filter out clutter or enhance the image, but it is much more accurate than the enhanced radars on other sites. If you are looking for a BIG radar, check out the National Mosaic radar. It is a large map of the US. You can click on a local area for the local radar. What in the world is a blog?